This extra high performance product has a SAE viscosity grade of 20w60 and is a semi synthetic multigrade engine oil. This product is made with enhanced performance additives and shear viscosity improvers to deliver higher protection at competition temperatures. It is formulated with full ZDDP (zinc/phosphorus) for ultimate protection. 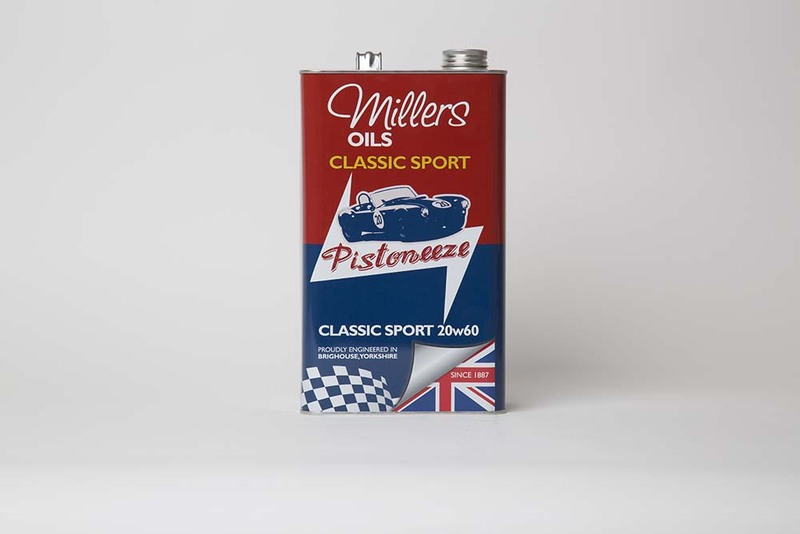 Ideally suited to Aston Martin, Jaguar, Ferrari, Lotus and similar high specific output engines., yet suitable for all discerning owners who want the best possible oil for their classic engine. Uses latest lubricant technology to engineer a premium semi synthetic multigrade for high performance classic engines. Incorporation of high levels of synthetic base fluids provides increased protection under arduous conditions of load and temperature. Maintains high oil pressures and reduces oil consumption. Added viscosity for high performance or for tuned vehicles that need extra protection over the 20w50. Health and Safety Data Sheet 7964 applies to this product. When used for the purpose recommended and with due regard to the appropriate Health and Safety Data, the product should cause no concern. If in doubt contact Performance Racing Oils. For Technical assistance call Performance Racing Oils at 865-200-4264. Click the button below to add the Millers Oils CLASSIC SPORT 20w60 to your wish list.